“I heard your Mother’s Day essay on the radio! Good job!” Rob, the owner of Oddfella’s Cantina said to me as I was coming through the Cantina door on my way to meet my husband for lunch. “It all started with you, Rob,” I surprised him by saying. He looked confused, so I explained. Two summers ago, our local newspaper announced a Father’s Day Essay contest. Fellow blogger, Fred from Fragments, was appointed to organize the contest and asked me to be a judge. As it turned out, only a handful of people submitted essays, but we did have readings of those and others at the Winter Sun Hall during our town’s “Spring into Summer” weekend event. During this period of time, Rob had been hosting Spoken Word events at the Cantina featuring members of the Writers’ Circle I belong to. On one such evening, he took to the stage himself and read an excerpt from a book he was working on. We all knew Rob was a talented musician and actor, but a writer too? He blew us away. At the Father’s Day Essay readings, Rob read an essay about his father teaching him to dive. I was so impressed and struck by the way he was able to communicate a tender love for his father, mixed with the regret of what his father wasn’t able to give him that I vowed then to write about my own father. The essay I ended up writing, titled “Let Me Clue You in about My Father,” became a turning point in my life. I had written “The Jim and Dan Stories,” a book about losing two brothers a month apart two years before. I was still immersed in missing my brothers and trying to penetrate the mystery of death. Writing my father’s story and honoring his service as a WWII vet got me excited about writing again. There are other things to write about besides Jim and Dan, I remember thinking. How cool to write about someone I love before they die. I didn’t know when I watched my dad from my mom’s kitchen window reading the essay with tears in his eyes last summer that 4 months later he would be gone. Knowing he had read the tribute and was touched by it was the fulfillment of the highest purpose writing it had served. But the words I wrote about my dad rippled out further than that. The affect the essay had on my mother caused her to wonder out loud if I would write one for her. After a few false starts, I did write a tribute to my mother, which aired on WVTF this past Mother’s Day. During the year I was working on telling my mother’s story, my father passed away, and the Father’s Day essay came into play again when I read to a church full of people who loved my dad as part of a shared family eulogy. My Father’s Day essay, initially inspired by Rob, seems to have a life of its own. It was recently purchased, along with photographs of my dad, by The Hull Times, the newspaper in the town where I grew up and my mother still lives (for what I call a “Boston price”). The Times published it last week for Father’s Day, the first one that my siblings and I have experienced without a father. Although it was emotional day for all of us, it’s good to know that my father’s story is being told and that his memory lives on. Post Notes: 1. 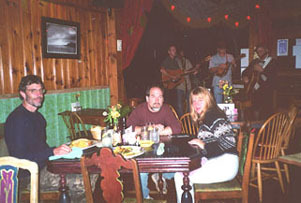 The first photo was taken in Oddfella’s Cantina of my husband, Joe (left), my sister Sherry and her husband, Nelson, when Sherry and Nelson were visiting in the fall of 2004. Rob is on the far left, playing music on stage. 2. 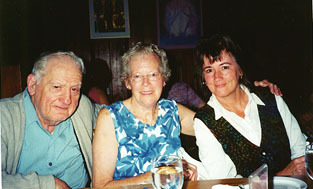 The second photo is of my father, mother, and me at The Pine Tavern on their last visit to Virginia in May of 2002. 3. My sister, Kathy, has written a Father’s Day piece called “Who Put the Honey in Your Heart?” You can read it on her blog here. And in so many ways your father lives on. Here I am up early and unable to sleep. I just sent out my family slide show for our Father's Day stuff and then I come across this blog and read your tribute to your Dad which I had somehow missed in the past. Once again I find a familiar thread. My Dad only went to the 8th grade and was in the CCC. He never went on to get a degree, but he also had street smarts. He ws lucky in that he war years were not so tragic. Sometimes you never know how words will affect the world, as they travel to unpredictable lengths! Words are extremely powerful and for them to continue to live on is the greatest compliment to the writer. Well done. We just had the monthly meeting of the JOY Club and part of the program devoted to fathers was the song by Mike Rutherford - The Living Years. He laments that his relationship with his dad was strained and that he didn't get to tell him what was in his heart in "the living years." You did and now have the memory and knowledge that your father knew how you felt about him before he left this earth. Great post. I can see your resemblance to your parents, Colleen. I will go and read your sister's story later. Wow! Visiting from Michele's and boy, am I impressed! This is a great, well-written blog! I'm hooked. Loved the piece about writing the tributes to your parents. I wrote one to my mother; I only wish I had done them for both her and dad before they died. Ah, well. Something tells me she saw it anyway! I am glad, for you, that your dad got to read your essay before he passed on. That must have meant so much to him. What a good daughter you were! Be proud of that. As always with all you do....beautiful. Lovely Lovely Colleen. You are so talented and your ability to express so much emotion in words is a great gift to those you love and to all of us, too. Secondly; I really love how everything interconnects. I'm pretty sure it must be our higher selves who nudge us to pay attention to an idea we've heard; helping us to have the will to follow through. Thirdly; dad loved your essay. I'm so glad he got to read it.